Yes, Dear Reader, I know it's a bit early for a traditional Rosh Hashanah treat. But when theDaughter, who can't eat despite anti-nausea meds up the kazoo days after a chemo round, finally announces she wants apples and honey, you jump and go get some. So I jump into my sandals and go semi-briskly walk (you try running while wearing flip-flops) over to the local version of Try-n-Save for a couple of little green apples. There are only two, two, two ingredients in this basic recipe. 1. Apple, and 2. Honey. Feel free to dress it up more grown-up-ish: mix into the honey a 1/4 teaspoon ginger and/or cinnamon and/or 1/8 tsp. cloves. 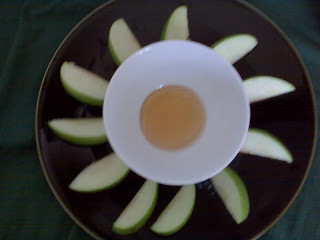 Plop honey into center of dinner-sized plate (to better catch drips). Alternatively, plop honey into a small bowl or shallow cup and place in center of dinner-sized plate (to better catch drips). Set aside.